5:30 a.m. on June 15 was very early. Guillaume and Angela had to be at Logan Airport by 6:30 a.m. Finally they were on the plane. Angela woke Guillaume up to smile for the camera. He didn't. Neither did she. Finally, they arrived in Las Vegas at 10:45 on Sunday morning. They took a taxi to the Paris Hotel. Guillaume was excited to have a new pair of sunglasses. Ooh La La, they arrived inside the Paris Hotel! The Montgolfier outside the Paris, next to the "Arch de Triomphe"
This traffic was not nearly as scary as the real thing! And took a picture in front, for Papy Pierre! Here is the Bellagio Hotel, home of the famous Bellagio fountains. On this afternoon, Angela & Guillaume saw the fountains "dance" to Elvis Presley's Viva Las Vegas! It was a very warm afternoon - 115 degrees (45 degrees celcius)! On Sunday evening, they went to dinner at the MGM Grand, at L'Atelier de Joel Robuchon. It was a wonderful dinner, and Angela enjoyed watching the cranky French chef! Surprise surprise, there is only one picture of food. After dinner, they went back to the Bellagio fountains. This time, the "dance" was the National Anthem, sung by Whitney Houston. They walked home to Paris. Angela wasn't sure if the picture was fuzzy, or if it was her head from too much wine. The Flamingo is the first hotel ever in Las Vegas. Before they went to bed, Guillaume tried his luck at the slot machines. He wanted to win $9,934,430. The next morning, they rented their SUV, and hit the road! They drove past the Hoover Dam, but didn't stop. A few miles later, and they entered the State of Arizona! They passed a convoy of antique cars with friendly people inside. They did not go to Los Angeles or Flagstaff. They just drove on a long, long, long road towards the Grand Canyon. Guillaume thinks that when the Rousseaus went to the Grand Canyon years ago, they saw this Steak House. Finally, they arrived at the Grand Canyon! It is very grand. On Tuesday morning, Guillaume woke Angela up very early to see some deer outside their lodge. Then she went back to bed while Guillaume went to see the sunrise. He came back and woke Angela up again so that they could have their coffee at the Grand Canyon. Even though Angela looks cranky in this picture, she was very happy that he woke her for this beautiful experience. They hit the road again, this time heading to Lake Powell. Angela was very relaxed in the car. He really enjoyed the SUV. Doesn't he look cool? On their way out of the Grand Canyon, they stopped along the way to see the Colorado River. Guillaume climbed up this tower. Angela waited below. Inside the tower were old Native American etchings on the wall. Because he saw this sign... They didn't see cows just yet. They arrived at Lake Powell, and tried to check into their hotel at around 1:00 p.m. The Chicken-McNugget-eating-front-desk-clerk told Angela that they couldn't check in until 3:00. Angela didn't want to check in at all. So, they drove to the Lake Powell Resort to see if there was availability. There was! They were fine with two bottles of water and a hat. Lake Powell is created with this Dam. After the very hot boat tour, they went to the bar at the resort for some ice cold Coronas! Since they were staying at Lake Powell for 2 nights, they took a side day trip to Monument Valley. It was a long, hot ride, and there were not many cars on the road. Angela drove for a while, and Guillaume relaxed. A lot. This is their first look at Monument Valley. You can see a squashed bug in the middle of the windshield. Here is Monument Valley without the squashed bug. They stopped to take a picture on the side of the road. Finally, they saw a cow. And a donkey and a baby donkey. Guillaume wanted to take a picture with the baby cow, but the baby cow ran away. Angela thought the cow was going to run into the street, but he didn't. Guillaume is standing in front of a lot of the "monuments". More cow signs on the way back to Lake Powell. But no more cows to be found. They decided to rent a speedboat on Thursday and boat around Lake Powell. They drove out to Antelope Point Marina. The marina actually rented them a boat! First, they took the boat to Navajo Canyon, then they went back to Antelope Canyon. They found a little beach, and went swimming. After they returned the boat, they headed off to Bryce Canyon. The ratty old sign says "Welcome to Utah." Angela thinks they could invest in a new sign. They saw a lot of horses and farms along the way. Before Bryce Canyon, they drove through Red Canyon. After they checked into their hotel, they went to Ruby's General Store, just across the street. Guillaume tried on some cowboy hats. After all the cowboy hats, Guillaume was in the mood for a real Western Rodeo! Just their luck, there was a rodeo just next door. First, little boys rode little bulls. Then, little girls rode horses pulled by their daddys. Then the real bull-riding began. This was "Number 2" (that's what Angela & Guillaume called the bull) - he was the only bull that looked angry. The rest of the bulls didn't try to throw off their rider. Then they ate Number 2. No, not really. But they did have a very good steak. The next day, they drove into Bryce Canyon. The red spires coming up from the ground are called Hoodoos. The Hoodoos were huge, and breathtakingly beautiful. They left the Park, and went 4-wheeling! There wasn't anyplace to shower after 4-wheeling, so they hit the road dusty and tired. But it was SO much fun! They saw little antelope all over the place. During the drive to Zion National Park, they saw an open range with many buffalo. An hour later, they arrived at Zion National Park. This tunnel went through a HUGE rock. By the time they left Zion Park, they were exhausted from their travels, and were happy to go home. The next morning, they returned the car, and got to the airport in plenty of time. First, they had breakfast. 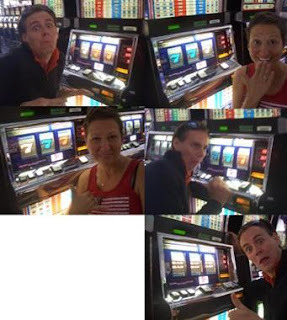 Then, they spent a few bucks on the slot machines. Hooray, they won! But these were 5-cent machines, so they didn't win much. After a long flight, they were finally home. They unpacked, all the laundry is done, and they are happily sitting on their couch. Petit Robert is happy they are home, too. Wahou !!! that looks really good, what a great road trip ! It's a real pleasure to see your amazing pictures. What a great adventure in the WWW!! Guillaume, you saw many new marvellous things we never saw..
We are back from our cruse on the Baltic Sea..Copenhague, Tallinn, St Pétersbourg, Helsinki and Stockholm; it was nice but the weather was not very good..